“…alla via così..” we sail on board of M/n Linea d’Ombra to discover the charming natural scenary of the Porto Grande,together with places,myths and legends inside this port that from the ancient times was the active centre of “ the greatest Greek city and the most beautiful of them”as Cicero described Syracuse. 1 Boarding area: Foro Italico near ex-Port authority. 3 Anapo and Ciane estuaries,well known in the Greek mythology:the god river Anapo and the Ciane nymph mixed their waters when she was changed into a spring by Pluton. 4 Mussels farm, area dedicated to the breedingfarm of mussels,which are fixed to the “bisso” (the higher part is visible). 5 Galera rock: rock in front of the Plemmirio Natural Marine Protected Area, within this first rock formation there were many underground passages,now the the sea abrasion effects are evident on the top. 6 Carrozze beach and the typical calcareous platform:there are ruins belonging to the Bronze Age (XV-XII B.C. 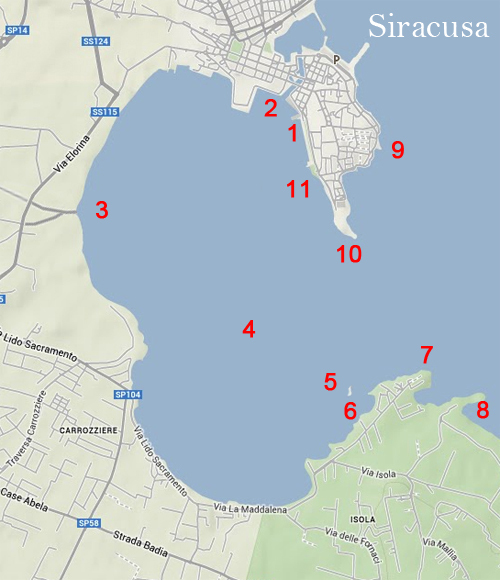 ), where Thapsos potshered were found. 10 Maniace Castle The Castello Maniace is a citadel and castle in Syracuse. It stands on a large promontory, where it was constructed between 1232 and 1240 by the Emperor Frederick II. It bears the name of George Maniakes, the Byzantine general who besieged and took the city in 1038. A notable feature of the castle is the decorated portal. Today the castle is open to public and is a local tourist attraction in Syracuse. 11 Arethusa fountain, a place rich in evocations overlooking the Porto Grande.The myth of her transformation begins when Arethusa came across a clear stream and began bathing, not knowing it was the river god Alpheus. He fell in love during their encounter, but she fled after discovering his presence and intentions, as she wished to remain a chaste attendant of Artemis. After a long chase, she prayed to her goddess to ask for protection. Artemis hid her in a cloud, but Alpheus was persistent. She began to perspire profusely from fear, and soon transformed into a stream. Artemis then broke the ground allowing Arethusa another attempt to flee. Her stream traveled under the earth to the island of Ortygia, but Alpheus flowed through the sea to reach her and mingle with her waters.